The Bison Armory 6.8 BSP consists of a rifle chambered in 6.8 SPC II, with a fast 1:7" rifling twist rate and a 6.8 SPC cartridge loaded with a custom made 200 grain bullet. The purpose of this configuration is to create an effective combined subsonic / full power platform for hunting and tactical situations. The 16" barrel is available HERE or you can build it into an upper assembly HERE. The 11.5" barrel is available HERE or you can build it into an upper assembly HERE. The 8.5" barrel is available HERE or you can build it into an upper assembly HERE. The closest competitor to the 6.8 BSP is the .300 Blackout. The Blackout shoots 220 to 240 grain bullets when operating subsonic, compared with our 200 grain 6.8 BSP bullet. Because muzzle energy is linearly proportional to bullet mass, the Blackout does have a slight advantage in muzzle energy when operating subsonic. But the .300 Blackout’s edge disappears quickly when things speed up. When operating with full power 6.8 SPC cartridges, the 6.8 BSP clearly dominates the Blackout by every measure, including muzzle energy, down-range energy, trajectory, and effective range. Case volume makes the 6.8 SPC an ideal base cartridge for subsonic applications. When combined with our 200 grain 6.8 BSP bullet and the right powder, like Hodgdon H4895, the 6.8 SPC case has very little empty space. Empty space is a common problem when loading subsonic rounds like the .308 Winchester. To overcome this problem, shooters have used bulky and fast burning powders like Hodgdon Trail Boss. This fills the case, but the burn rate of this powder is very fast such that the pressure generated in the barrel is insufficient to cycle the action. 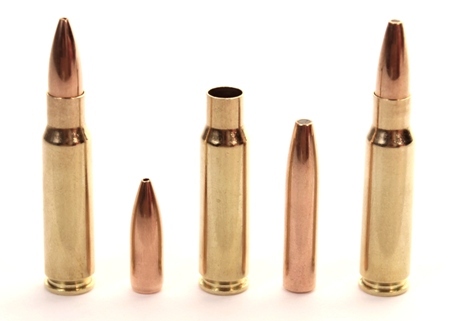 The .300 Blackout dodges the problem of excess case volume by using a .223 case necked up to .308 caliber. The downside to this approach is the diminished case volume for full power applications. To overcome this problem, relatively light and stubby .308 bullets are used to maximize the powder charge in the case. However, aerodynamic drag is higher on a stubbier bullet, so down range performance suffers significantly. We have found that our 200 grain 6.8 BSP bullets with 14.2 grains of Hodgdon 4895, loaded with an OAL of 2.26 inches, deliver perfect subsonic performance in a 16" barrel. H322 and H335 also work and starting around 14 grains in a 16" barrel is good. For the 11.5" and 8.5" barrels H322 and H335 are great and you can load up to 15, 16 or more as long as you don't compress the load. Keep working up until you get proper cycling and keep it below supersonic velocity. The 1:7" twist of the 6.8 BSP barrel is just fast enough to stabilize our 200 grain bullets. At 100 yards, you will notice that the bullet holes in your target are somewhat oval, rather than round, which shows that the bullet is coning a small amount in flight. Since bullet expansion is typically poor at subsonic velocities, a slightly coning bullet is very effective, as it will produce a devastating injury.